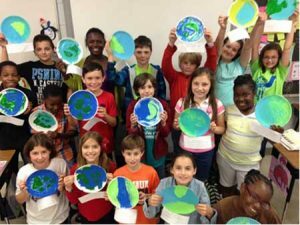 Mrs. Parker’s 4th grade students holding their Earth Day promises. Merriwether Elementary School’s 4th grade students honored Earth Day on Tuesday, April 22. Students began by using their artistic skills to make paintings of the Earth. Students also wrote promises to the Earth. Some examples of student promises were to reduce, reuse, and recycle and others promised not to litter. Students all came to the conclusion that one day is not enough for Earth Day. In addition, students took a few minutes out of their day to clean up their playground area, collecting pieces of trash on the fence line and pencils left under picnic tables to beautify the land. Everyone was inspired by a read aloud, “The Junkyard Wonders” by Patricia Polacco, and had fantastic ideas of ways to repurpose and reuse items that are commonly called “trash” at their own homes. After all, everyday is Earth Day!